Proud father of young maestros, Sri.Mahadevappa was born in a tiny village called Mudigundam near Mysore . Born with natural talents in Music and other arts, he got initiated to classical music very early. He also got opportunity to act in many local drama companies. He had his formal training in vocal music and violin under the tutelage of Sri Narayana swamy of Kollegal. Later he was accepted as a student by one of the great musicians of Karnataka Sri. T. Puttaswamiah, younger brother of legendary Sri. T. Chowdiah. Mahadevappa shifted to Mysore and had a rigorous training in a traditional Gugukula system of learning under the great Guru. It was here where Mahadevappa was introduced to the great musical ideas of chaste classical music. Guru taught the obedient student and made him a wonderful musician perfecting all sections of the great divine art. Mahadevappa's artistry is the quintessence of the pristine purity of the respected Bidaram school of Music (Sri Thyagarajaswamy Paramapara) in which he is the torch bearer. It did not take long for Sri.Mahadevappa to establish as a leading violinist as his outstanding violin skills were recognized by one and all. He had the opportunity to widen his musical ideas by accompanying some of the greatest musicians of yester years. One of the most successful violinists and teachers, Sri Mahadevappa was offered the post of the Head of the department of Violin at the famous University of Mysore where he served as a professor for almost 26 years. 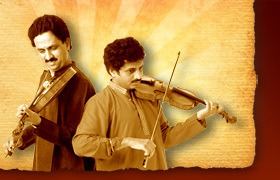 Consolidating the enormous achievements of his predecessors, and different new approach of contemporary Violinists, Mahadevappa designed totally new and complete Violin techniques creating an ideal style to express the great versatility of Violin with the strict adherence to the Classicism. Sri Mahadevappa taught this brand new style of violin playing to his naturally gifted boys in a very traditional manner. A well-known task master, Mahadevappa hardly allowed his children to play at all. Constantly monitoring the progress of his children, Mahadevappa taught all the intricacies of Carnatic music to his brilliant sons, making them complete masters of the great traditional Music. It is a known fact that while teaching his sons, he used his Violin bow more to beat his children than playing violin! That is the nature of his strict teaching! The new style is a remarkable combination of strict adherence to the classicism , perfect blend of emotive appeal , technical mastery, intellectual sophistication, virtuosity and amazing creativity. With the fidelity to pitch, rhythm and ornamentation, and proper perception of the musical spirit of great composers, Mysore brothers could stand out as deeply evolved musicians. 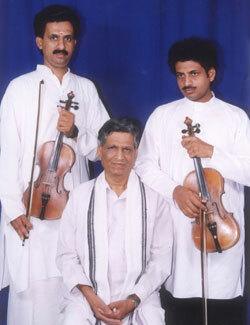 Though the Mahadevappa contributed his two golden boys to the field of music, his significant services in training many other reputed violinists & vocalists are highly praised. He is very actively involved in a great number of Music promotional works in Mysore city organizing various music series, conferences and also being honorary member of many distinguished organizations. He also served as the chairperson of the selection committee of Mysore palace Police Band musicians. Recognizing his invaluable services in the field of music, Government of Karnataka has honored him with the highest state music Award ‘State Sangeetha Vidwan”. He was also nominated a member of Karnataka state Sangeetha Nritya Academy twice. He is been an honorary chairperson of a number of reputed government bodies too. He was nominated the President of the prestigious JSS Music conference and was honored with the title of Sangeetha Vidyanidhi in the year 2001.